How Much is Inside an Acre? What does a picture of an acre look like? How much is inside an acre? As all farmers and real estate agents know, an acre is defined as an area one furlong long by 4 rods wide. An acre is standard measurement used in the United States and the UK. It was commonly known as the amount of land a farmer could plow in one day with an yoke of oxen. It took the real estate agent a lot longer. A look online will tell you an acre is equal to 43,560 square feet, but how big is that? Knowing how hard big numbers are to visualize, I hatched an elaborate plan to mark and photograph an acre. 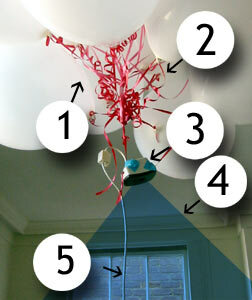 1) Balloons filled with helium, 2) festive ribbons, 3) a tiny security camera with a 4) wide view and a 5) 80 foot cord. With balloons and a fresh tank of helium from PARTY CITY, we headed to the University of New Orleans to draft the top meteorologists, videographers and aviators in the country. Those guys were really busy, so we used students from her media class instead. All the students were eager (or at least willing) to help me see this plan come together. Especially Colonel John "Hannibal" Smith. 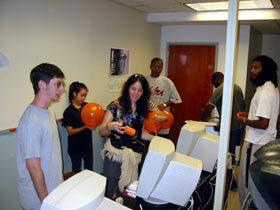 Everyone helped to fill the balloons and tie the ribbons. It was like my 8th birthday party, except with taller guests and no undercover cops. 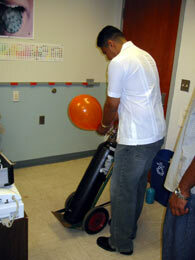 I was afraid the students wouldn't feel comfortable interacting with the tank of helium, but my fears were unfounded. Despite its noble place on the periodic table, they treated the tank like they would any other gas. 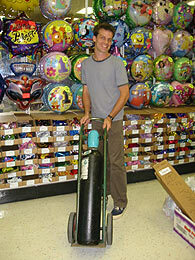 When 72 balloons were full, the lift was impressive. We tied them together and brought them outside. 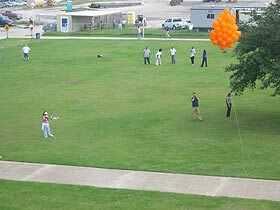 If the balloons flew high enough, Wendy and I knew the camera would be able to get a nice shot of an acre. I was also hoping to get some aerial photos of the neighbor's bikini pool-party. 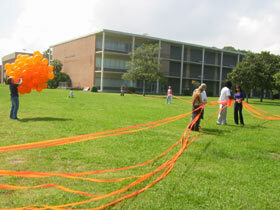 Outside on the lawn, the students measured four 208¾ ft ribbons and staked out the edges of a giant square. 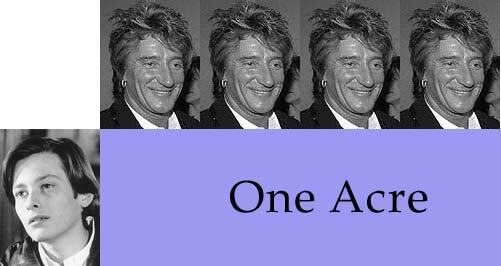 It was exactly one acre! After this moment, everyone was extra careful. We've all heard on television how flammable acres are. 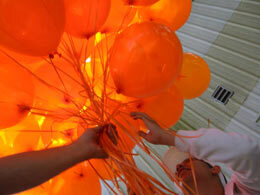 We attached the camera and let the balloons soar high into the air, like a giant flock of orange eagles! Ok, not really. A strong wind was blowing southwest off of Lake Pontchartrain, pulling at the cable until the balloons were flying nearly horizontal. 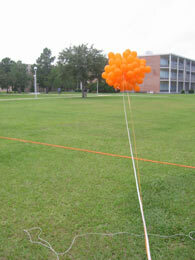 Even with 50 feet of cable out, the balloons refused to lift the tiny camera. Hurricane Lili was still two days away, but the wind was already blowing very briskly. I called Governor Foster and asked him to declare this experiment a state of disaster. 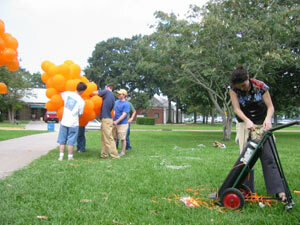 We threw a bunch of ideas around, but nothing we did could help get those balloons aloft. 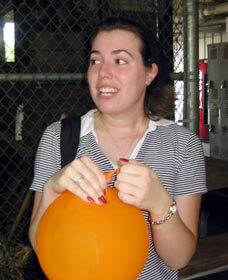 We added 40 more balloons to the morula, exhausting our supply of helium. Unfortunately these new balloons increased the wind resistance, making little difference. 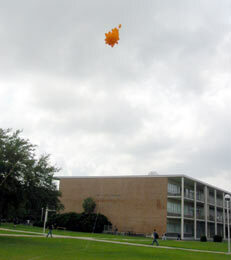 After more than an hour, we realized that by running in the direction of the wind while playing out cord, we could get the balloons about 90 feet into the air. This photograph shows our tobikko sculpture at its greatest altitude. Unfortunately, this still wasn't high enough to capture a view of the marked acre. In the background of this photo is the three-story liberal arts building. Recognizing the failure of the balloons, I climbed to the third floor balcony of the liberal arts building and took some photos of the action on the field. I couldn't fit the whole acre in a single photo, but I knew I could recreate the scene by stitching them together in Photoshop. Here is the result, a fisheye mosaic of photos. 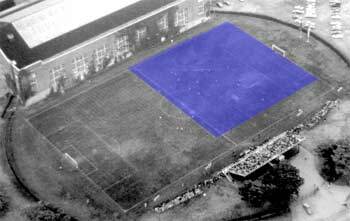 The blue area is one acre. 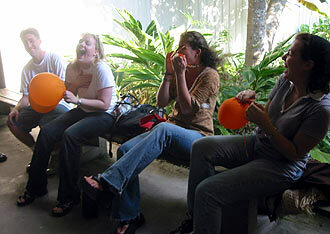 The helium was so ineffective outside that we brought the balloons inside to sample them. 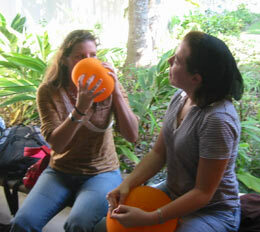 First Angelle tried inhaling the helium.. it seemed good. Next came Hayley and her friend. Was it helium? Some other gas? A high-pitched chemistry debate ensued. Extremely high-pitched. 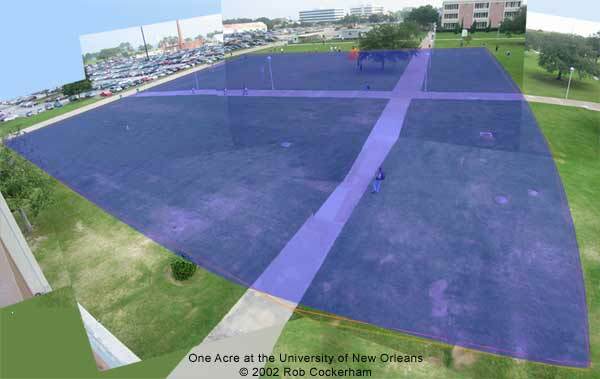 To help you visualize the size of an acre, I've made this illustration: A blue one-acre square overlaying a football field. More one acre field illustrations here. If the balloon-lifted camera plan had worked out (and the camera had flown all the way to the Yale Soccer field), I would have captured an image like this one. See more one acre photos here.